If I am an individual (sole trader) or charity can I apply to the fund? Yes. Do note that the charity would need to employ fewer than 250 people. You can submit multiple applications but when one has been successful you can’t apply for further collaborative research award for another 12 months. Can I submit the same application under a different round if it was not successful in the original application? You may resubmit your application but we suggest that your project is reviewed for suitability and compliance. Feedback will be given when your application is unsuccessful (upon request) and this needs to be taken into account with any re-submission. Why should the application have to come from the creative? Because the aim of The Exchange is to encourage new models of Collaborative Research that will directly support the Creative and Cultural Industries, we are encouraging the applications to be submitted by the creative partner. We would expect however that the academic partner would also be involved in helping to draft and shape the application. The budget should be allocated through a process of negotiation between the partners, but the funding will go to the creative, and any agreed fee will be paid by them to the researcher. With regard to the actual application form, can we use more imaginative ways of presenting the answers to the required questions i.e. illustrations, videos? The submission of diagrams and illustrations will be accepted but these should be alongside the text-based application. Videos and/or other media cannot be accepted. Can I submit a second application as a continuation to a previously funded Collaborative Research Award? After twelve months, you may be able to submit another application but it would have to be argued that it is significantly different to, or a significant progression from, the first project that was supported. 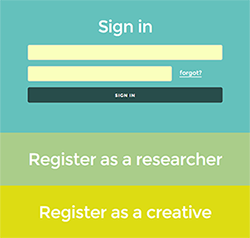 Ideally though, the Collaborative Research Awards scheme is to enable applicants to progress towards other funding streams or methods of monetisation. How many times can I receive funding through the Collaborative Research Award Scheme? As previously stated, creatives can normally receive one voucher per year (the year is considered to start from the date of award not the date of the application submission). If successful how does the creative receive the award? The creative will be asked to submit their company details to The Culture Capital Exchange (TCCE) which manages The Exchange. Upon receipt of a signed offer letter, payment of 75% of the Collaborative Research Award will be made. Please note that it can take up to 3 weeks between signed offer letter being received and payment being made. Upon completion of the project you may invoice for the remaining 25%. You will be expected to submit a final project report prior to the final instalment of the grant being paid. If successful how does the academic partner receive the funding? This should be negotiated as part of the process of developing your Collaborative Research Award application. If necessary the research should seek guidance from their institutional research office. Due to the small amounts involved Full Economic Costing should not be applied to these awards, and pilot partner HEIs have agreed to this. When do we have to start the Collaborative Research project? You are advised to start your project as soon after the award date as possible. If you do not think you will be ready we advise you to consider applying for a different round. Is there a degree of flexibility on the length and timescale of approved Collaborative Research Award projects? We encourage projects to be completed in 3 months but we accept that the research may in some instances go on in some form after the formal completion of the project. Please ensure that you communicate with us on any changes to your proposed timetable. Can doctoral students work on the projects? Yes, provided that they submit a letter of support from their supervisor. How much support can I get from other staff in my academic institution on the project? We expect that support staff such as those working in Research and Innovation offices may be able to offer you some advice and support if required but it is expected that the academic will take ultimate responsibility for developing their part of the application and budget and for ensuring the success of the project. What counts as eligible expenditure? Creatives can use the grant for salaries and other staff costs such as for freelancers. You may include reasonable travel and subsistence costs as long as they are essential to the project. You can also include licence fees if essential to the project. Academics can use the grant to free up their time for research on the project, with the approval of their Head/Line Manager. They may use the grant for reasonable travel and subsistence as long as they are essential to the project. What would be considered ineligible expenditure? For creatives core business costs will NOT be covered. Core business costs include business filing and accountant fees, insurances, utilities and equipment that are normally used by the business. For Academics ineligible expenditure includes equipment not essential to the project. As previously stated, Full Economic Costing should not be applied to these awards. What kind of proposals are not eligible for a Collaborative Research Award? Proposals that are not related to the creative or cultural industries. Who will make the funding decisions? The applications will be checked for eligibility and will be reviewed by members of The Exchange Steering Group. Applicants will be informed about the outcome, whether successful or unsuccessful within 6 weeks. Unsuccessful applicants will be able to have feedback if helpful. Who will own the IP in the projects? If you feel that your project will generate IP of any potential value, we ask that this it decided upon by the partnership applying for Collaborative Research Award before application and submitted with the proposal. If you have any other questions please contact The Exchange on 020 7420 9440 or info@tcce.co.uk.